This finding, which comes out of the Columbia Business School’s Center for Decision Sciences, complements one survey that found that close to half of all people contemplate their date of retirement for no more than 12 months. For most Americans, the default age for starting up their Social Security benefits is 62, when workers first become eligible for them. So the researchers looked into the decision-making process by changing this default frame of mind: they prompted some of their research subjects to think about the benefits of claiming their benefits early – wanting to relax in old age, current financial problems, or concern they will not live to a ripe old age – before asking them to think about delaying claiming. Another group was prompted to think first about the benefits of waiting to claim and, only after that, to consider early claiming. Benefits of waiting might include having a bigger monthly Social Security check and more money for medical bills, enjoying work, or a family history of longevity. (Other research shows that people are not very good at predicting their own life expectancy). “Asking participants to list thoughts favoring later claiming before listing thoughts favoring early claiming encouraged participants to treat later claiming as the implicit default,” the Columbia study concluded. Full disclosure: The research cited in this post was funded by a grant from the U.S. Social Security Administration (SSA), including some research funded through the Retirement Research Consortium, which also funds this blog. The opinions and conclusions expressed are solely those of the blog’s author and do not represent the opinions or policy of SSA or any agency of the federal government. A pretty obvious flaw in this study is that being asked to think about something is not at all like thinking about it on your own. In a setting with an authority figure (i.e., the researcher, people will (1) want to please the researcher, and (2) assume the researcher thinks the right answer is first one (why else would she ask it first?) The reason people file earlier is that they need the money, or value a present dollar a lot more than a future one. I think that more people have age 62 in their minds as a retirement date since the economic downturn, some voluntarily and some forced into this decision. Few people can think long-term when it comes to retirement, as evidenced by many issues related to long-term retirement planning and saving. I also think the Social Security Administration could do more to get the word out about the advantages of planning and the pros and cons of when to start receiving benefits. It’s different for everyone and never easy. I believe a bird in the hand is worth two in the bush. Take Social Security at 62 if you are not working and/or paying into the program in a substantial way. Clearly one significant issue has been overlooked. Many people have very low faith that Social Security will be around to help provide for their retirement. I believe this is the primary motivating factor in people claiming at the earliest possible date. This is one of the most difficult decisions a future retiree must make. But only if they have a choice to retire. 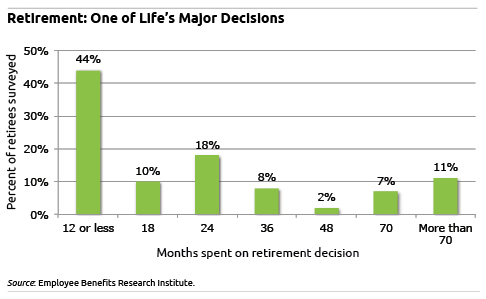 For most of us, like myself, I have no other retirement money saved so I will be forced to work till 70. That’s if I still have job then.